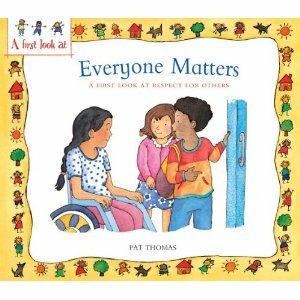 Everyone Matters by Pat Thomas is a story that introduces children to the concept of respect and how important it is to treat everyone with respect. In the very beginning of the story respect is defined and explained as valuing and understanding other people just as you would value your own self. This creates a focus on the positive traits that people have more so than the negative. There is a distinction made between the respect that everyone deserves and the respect that is earned. This story does an excellent job in describing how respect is earned because it is not something that can be forced. Overall, this book focuses on the equality of every person and provides excellent examples of how to achieve that equality. Element Two: Respect for Others discusses the importance of creating an atmosphere that respects the diversity of students and listening to others with kindness and respect when a classmate is explaining their own experiences or ideas. I feel that this book does an excellent job in supporting this element. The author explains how everyone is different and the various ways that respect is deserved as well as earned. Respect is deserved among all people and the author explains this as treating someone as your equal. By believing someone is just as good as you are, you are more likely to form better relationships, seeing your similarities rather than your differences. The author also explains how respected is earned. Respect is earned by keeping promises, treating others the way you want to be treated, and being honest with others. The author does an excellent job in explaining that being afraid of someone does not show respect. When this happens you feel intimidated or scared to confront that person and feel as if they are better than you. Respect is the exact opposite, making you feel as if you are just as important as that person. This story displays excellent illustrations where someone may look upset or scared and how those facial expressions change from fear into happiness. The gestures also change from pointing at someone into hugging, or giving them a pat on the shoulder. An activity that I would do would focus on the part of the book that discusses how it is okay to disagree with someone as long as you are able to respect them in the process. For children at a young age this may be a difficult concept. It may be hard for a student to gain the confidence to disagree with someone, or they may not know how to go about it in a respectful way so instead they shy away from voicing their opinions. To help students with this I would have children bring in a picture of themselves from home. I would then have the children glue this picture of them onto a piece of construction paper and around the picture would be five to ten statements or pictures of how they view respect. The finished product would be displayed on the classroom wall as a point of reference to see how their peers view respect. This can be referred back to when students are forming opinions and need a reminder on how to respectfully disagree without hurting someone’s feelings.